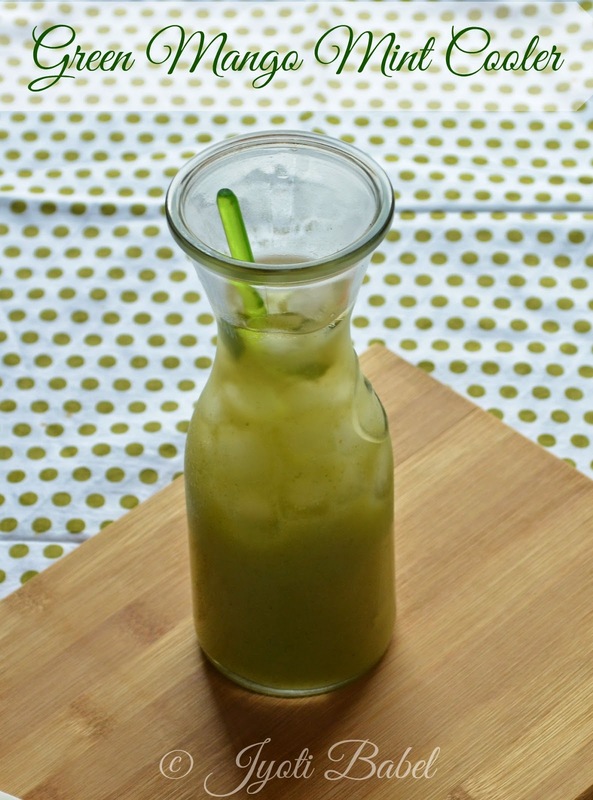 Kairi Panna or Panha is a sweet and tangy Indian summer drink made primarily from green mangoes, mint and some spices. It is one of the most popular drinks preparation using raw mango in India. With mint as one of its main ingredients, it is said to be very cooling and soothing for the body. Summers are already here in India and the mercury doesn't show any signs of relenting. What can come to our rescue in such times are obviously chilled homemade drinks. 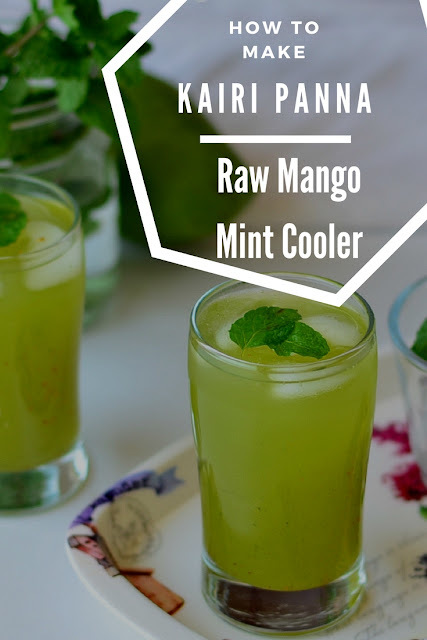 This summer it is time to stay away from bottled high sugar drinks and go for homemade thirst quenchers like this mango mint cooler, a.k.a Kairi Panna. 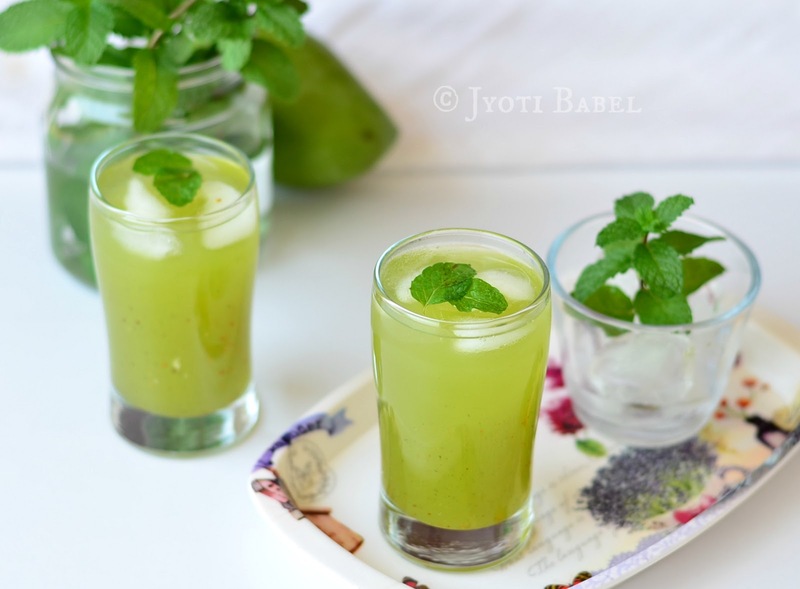 I use a lot of fresh mint in making these, which gives this drink a nice green colour. These mint are from my balcony garden and I am so elated to use them. By the way, do you know you can easily grow mint from its stems? 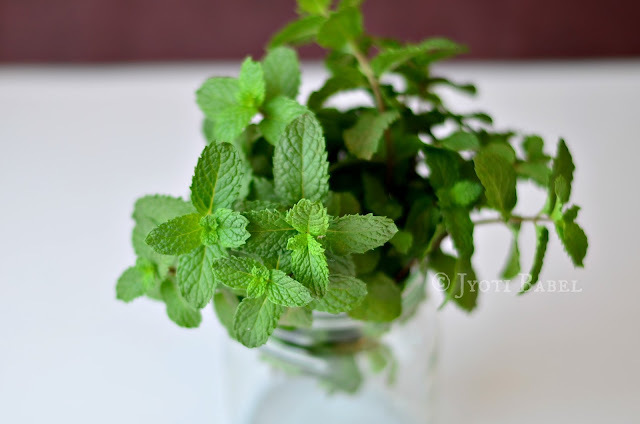 Check out my post on how to grow mint from stems at home. Now coming back to the recipe. The green mango used in this drink needs to be cooked and pulped first. Here is how I go about it. How to prepare green mango pulp? I generally prepare the mango pulp by cooking the mangoes in a pressure cooker for 2 whistles on medium-high flame. Once the cooked mangoes are cooled down, I scrape off the pulp from the cooked mangoes. This pulp can be frozen in the ice tray into ice cubes which you can later store in zip lock bags. When needed just take the number of ice-cubes you need and get going. 1/4 to 1/2 cup green mango pulp, depending on how tart it is. Churn the mango pulp and mint leaves in a mixer till smooth. Strain it to remove any fibrous part. In a tall jar add the mint and mango pulp, add the water, the prepared sugar syrup, black salt and roasted cumin. Adjust spices and sugar as per your need. Stir till well combined. Add loads of ice cubes and pour into glasses. Serve chilled. Super refreshing cooler, definitely a prefect summer drink. What a pretty green you have there , Home made mint must be so heavenly , I will definitely read your mint post on growing mint at home . wow such an refreshing kairi panna there jyothi. perfect thirst quencher for summer ..How wonderful they look, loving the color. Such a refreshing drink and a perfect drink for upcoming summer. I heard it is already very hot in India. Superb clicks and love the addition of mint in the traditional aam ka panna. The pictures are stunning Jyothi..too good! Perfect summer drink..Mangoes with mint sounds refreshing..
Aam panna is my favorite summer drink. So refreshing and cool drink for hot summer days. I dont mind drinking this incredible mango mint cooler anytime of the day. Super refreshing they looks. omg such a refreshing drink u have made. Look at the colour. It looks perfect. This is such a great drink for this scorching heat..